I never had any respect for the TV channels (Indian or phoren) and even lesser for the people on and behind the scenes. But Sridevi's demise has the Indian media competing with each other and lowering the already low standards of journalism to even lower depths... thanks for their craze for TRPs or grab eyeballs. 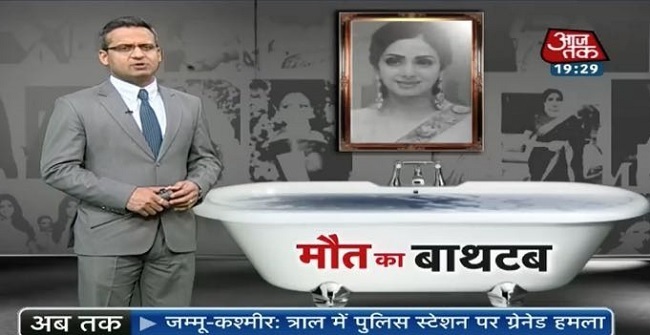 >>> the award for the most ghoulish should go to Telugu channel Mahaa News which had their crime bureau chief conduct a bathtub investigation on air. Standing in a bathroom, the journalist is positioned next to a pink bathtub and asks, "Did Sridevi slip and fall into the bathtub or is there some other angle to this?" He then claims that the bathtub Sridevi was using must have been of '3 feet height and 2 feet length' (don't worry, we're as confused as you are) and that he's in a similar tub. To set any doubts we may have about the issue to rest, he climbs into the tub and demonstrates that there's no way anyone could have drowned in it, even if she'd been lying down. Sherlock also adds that Sridevi could have easily climbed out of the bathtub if she'd wanted to. "So did anyone MAKE Sridevi drown in the bathtub?" he puts forth the explosive question he'd been itching to ask from the beginning.